On this variant rights societies on Side B are shown in separate boxes with NCB above BIEM. Rights Society (A & B): B.I.E.M. 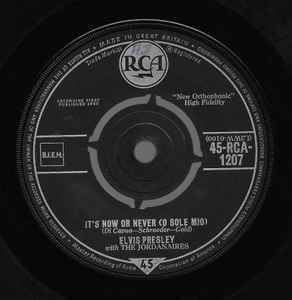 This great classic also came out as a Living Stereo 7" 45 45-617777 and was the second of 4 early 60's EAP singles to do so. Absolutley knock out in Stereo. Two great original 69 70 RCA singles were sadly and pontlessly over looked for stereo single release, Suspicious Minds and The Wonder Of You (SM had to wait a long time for a proper and matched to the mono single Stereo release crazy or what!) These tracks were after Zager & Evans etc. Hi have Pressed in Republic of Ireland version.